Was on the Greek island of Paros, June 9th 2011, at 23.00 hrs an almighty impact on a titanic scale, which may later be recalled as the first steps of mankind into a brand new dimension. The venue was the charming restaurant ‘Franca Scala’ located at Parikia. Twelve lucky people had witnessed an Avatar walking through a three-dimensional world, steered only by nothing more then the human brain and their body. No cables, no keyboard, no mouse, just the performer who came directly from London to Paros to display their Avatar persona to present this new work in progress called “The colliding” by the Greek artist Liliana Papadopoulou, better known here by her virtual name ‘Navah Dreams’. About twenty years ago the fist 3D software was developed for architects and designers to make it possible to look into a building in various ways. The tool for this commonly called “the camera” and the pathway this camera is moved along a camera path. In big construction projects it is now quite common that an architect presents some digital movies so everyone can view a visual image of their ideas and concepts. The Avatar can be, and often is, used as the camera. It comes in the shape of an object, like for an example could be that of a vacuum cleaner of a house, but this cleaner may look like a person, indeed often looking better as the owner of the future building might look in “real life”. It may have some correlations with current fashion trends. If you want to sell clothes you will look for nice models to present them, everyone knows the consumer who will probably buy them won’t look like the presenters. So the impact to use an Avatar for presentation of the Art was quite a logical step. Also, that the presenter, calling himself in his 3D-world ‘First Prim’, in real life Reiner Schneeberger, was looking for artworks suited to get the best picture for his ongoing mission. The project he has called “I in 3D”, Simulacron-1 or World on a Wire. For the Cheiron talk he selected some works of Liliana, previously presented at IPAC exhibition “European Passages” last summer in Apothiki art gallery. He presented them by using an Avatar named ‘Art Blue’. So he was like the aforementioned vacuum cleaner walking around in the Globes Liliana had made. 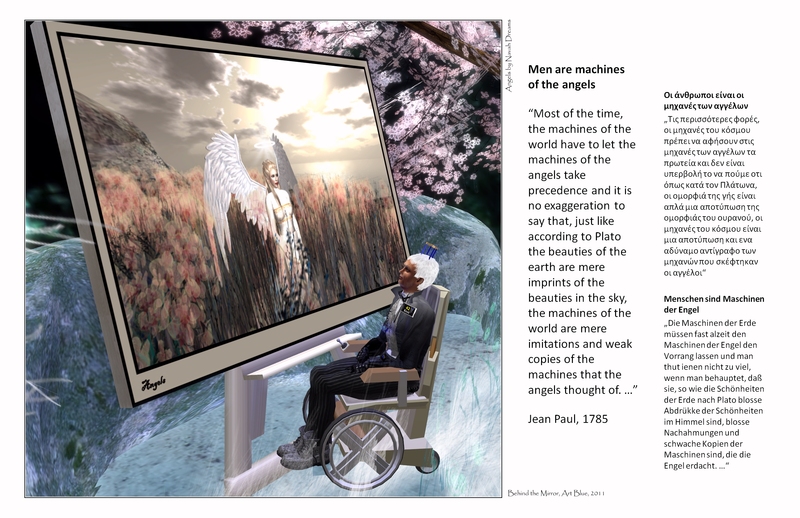 This artwork is inspired by the classic science fiction movie “Silent running” (1972) and by passages out of a short story “Men are machines of the angels” by Jean Paul (1785). The easiest way to get an impression is to look in the internet for the Globes at http://issue.com/artblue. For the twelve lucky guests at Franca Scala it was quite a unique experience to see an actual Avatar walking around as if it were alive, and able to look at the virtual world made by Navah Dreams, seen by Art Blue, and brought forward to the audience on two big presentation screens. The event was sponsored by a German medical company, the presenter gave us some ideas how the 3D technology will have a major impact on the daily way we use the internet in the near future. The two-dimensional presentations can get easily into a third dimension (by adding time). This technology was developed by the Swedish trend pioneer Dr. Rosling and is now free to use as Google Info graphics. It’s a big picture for teaching and using statistics under complex conditions. The presenter chose a strange way to show the potential of Info graphics that will hold long in the memories of some of the spectators: The probability of getting lung cancer, by comparing gender, income situation and the amount of smokers on a world map from 1970 until now as a dynamic moving graphic chart with might precedes the common known Microsoft Power Point. Also First Prim showed abilities to use one of the modern internet browsers supporting web 3D (Google Chrome and Firefox). He inspired the audience to look at the 3D-Google-body before he went deeper into a 3D-enviroment by using an Avatar walking around a factory that will be build in 2012 for producing medical equipments. So there was nothing more as to enjoy the menu that was brought to attention by Frangiskos, owner of Franca Scala. The discussion about virtual worlds moved on inspired by some Paros wine as Barry Tangrin offered Liliana to use his body as an Avatar “in all the way she likes”, she took the chance, made a photo and placed him as a ‘cartoon’ in one of her virtual installations inviting Art Blue to an exclusive visit and bring this Barry forward as a screenshot to Paros life.